The University of Alaska Fairbanks (UAF) is a public research university in Fairbanks, Alaska. It is the flagship campus of the University of Alaska system. UAF is a Land, Sea, and Space Grant institution – one of only a handful of triple-crown universities in the country – and it also participates in the Sun Grant program through Oregon State University. UAF is located just 200 miles south of the Arctic Circle, so it is known as “America’s Arctic University.” The campus is favorably situated just four miles west of downtown Fairbanks, in a unique location for arctic and northern research. The Northern Lights, also known as aurora borealis, can be seen most of the year in Fairbanks. So if you’ve always wanted to see them, this is the school for you! UAF was established in 1917 as the Alaska Agricultural College and School of Mines, focusing on research and teaching in support of agriculture and mining. Its opening day was on September 18, 1922, offering 16 different courses to a student body of six (at a ratio of one faculty member per student!). The institution has been accredited since 1934 by the Northwest Commission on Colleges and Universities. In 1935, the Alaska Legislature officially re-named it the University of Alaska to reflect the school’s expanding role in research, teaching, and public service. World War II brought a rapid influx of population and development to the Alaskan territory. Wartime national awareness of the need for scientific polar research in the interests of defense and communications led to the establishment in 1946 of UAF’s Geophysical Institute. Since its inception, the institute has earned an international reputation for studies of the Earth and its physical environment at high latitudes. UAF played a significant role in the territory’s drive for statehood, when the Alaska Constitutional Convention was held in the newly constructed Student Union building on campus. The Alaska Constitution was drafted in what is now known as Constitution Hall and it was signed in stately Signers’ Hall, now the home of UAF student services and administrative offices. After Alaska became the nation’s 49th state in 1959, both the university’s student population and its research mission grew tremendously. In 1960, the academic departments at UAF were divided into six colleges: Arts and Letters; Behavioral Sciences and Education; Biological Sciences and Renewable Resources; Business, Economics, and Government; Earth Sciences and Mineral Industry; and Mathematics, Physical Sciences, and Engineering. UAF’s seven major research units include: the Agricultural and Forestry Experiment Station; the Geophysical Institute (which operates Poker Flat Research Range, the only university-owned rocket range in the world); the International Arctic Research Center; the Arctic Region Supercomputing Center; the Institute of Arctic Biology; the Institute of Marine Science; and the Institute of Northern Engineering. The goals of UAF’s research facilities are to “create and disseminate new knowledge, insight, technology, artistic and scholarly works” emphasizing the circumpolar North and its diverse peoples. UAF’s research in arctic biology, arctic engineering, geophysics, supercomputing, and aboriginal studies is renowned worldwide. Since 1972 the university has supported research, documentation and teaching of Alaska’s 20 native languages. In 2017, UAF will celebrate 100 years of making important contributions to Alaska, by helping find solutions to the state’s unique challenges in areas like Arctic engineering, wildlife biology, health care and education. UAF is consistently among the top 100 universities in the nation for funding from the National Science Foundation. UAF is the primary doctoral degree-granting institution in Alaska, offering Ph.D. degrees in anthropology, indigenous studies, several of the physical and natural sciences, psychology, mathematics and engineering. Master’s degrees are offered in almost 40 fields in the humanities, social sciences, northern studies, physical and natural sciences, and in professional fields such as engineering, justice, education and business administration. Interdisciplinary programs are possible for students who have a focus in areas such as Pacific Rim studies where UAF has faculty expertise and research facilities. UAF’s colleges and schools offer degrees and certificates in 117 disciplines with a variety of vocational and technical programs. UAF is unique in that students can obtain Associate’s Degrees and Occupational Certificates at the university, which in most places are only available at community colleges. UAF learning centers in outlying communities also provide education services to rural Alaskans. In its commitment to quality, UAF acts continually to assess and improve the educational experience for its students. Faculty and administrators evaluate courses in the core curriculum every year. Each degree program and certificate is assessed at least every five years. The learning outcomes expected for each degree program can be viewed at www.uaf.edu/provost/assessment-review/assessment. At UAF you are an individual, not just a face in the crowd. You will get to know the faculty not just as professors, but as friends, advisors and mentors. Once you have chosen a major, you will be assigned a faculty advisor from your academic department. Your advisor will help you choose classes each semester and will explain programs and requirements. You will find that UAF faculty members are among the best in the country, and because of the low 11:1 student-faculty ratio, you will receive more personal attention here than you would at almost any other public university in the nation. Students evaluate their teachers at the end of each semester; those student opinion reports are available at www.asuafstudentgov.org/teacher-and-course-evaluations1. UAF’s eLearning and Distance Education is an independent learning and distance delivery program that provides quality education with flexible courses for non-traditional students. They offer a variety of regionally accredited college courses in print-based or online formats. UAF students can attend classes through distance delivery from remote areas of Alaska or from anywhere in the world. Using computers, telephones and the Internet, students can take courses or work toward their degrees at anytime without leaving home. Full degree programs available online include Bachelor’s Degrees in Criminal Justice, Business Administration, Homeland Security & Emergency Management; and Graduate Degrees in Security & Disaster Management, Administration of Justice, Master of Education in Online Innovation & Design, and Master in Business Administration. UAF’s enrollment in Fall 2014 was 9,992 students. Of those, 59 percent are female and 41 percent male; 88 percent are undergraduate and 12 percent are graduate students. UAF students hail from 49 states and 45 foreign countries. UAF has several student residence halls with housing offered year-round. All halls are smoke-free. Each hall has a kitchen, laundry facility, exterior door hall access system, and maintenance services. The halls vary from each other slightly to suit different preferences of the student population. There are 130 different student organizations on campus. Students produce the weekly Sun Star newspaper, run the campus radio station KSUA, and participate in scores of special interest groups. UAF’s public service role is filled in part by the statewide Cooperative Extension Service with its 13 district offices. Public broadcasting stations KUAC FM and TV, the first public stations in the state, are headquartered at UAF. UAF sports teams are called the Alaska Nanooks, with the word Nanook derived from the Inupiaq word for “polar bear.” The school colors are blue and gold. The Alaska Nanooks compete at the NCAA Division I level in hockey as a member of the Western Collegiate Hockey Association. The Alaska Nanooks also have a Division I rifle team which has won ten NCAA National Rifle Championships. The rifle team is a member of the Patriot Rifle Conference. Although UAF has no football program, it offers men’s and women’s Nordic skiing teams, men’s and women’s basketball, women’s volleyball and swim teams, and cross country running. The University of Alaska Museum of the North is located on the Fairbanks campus. 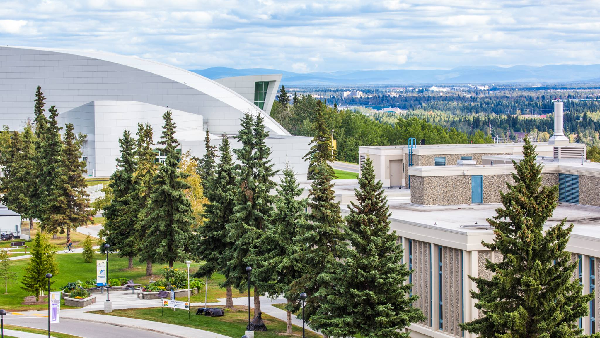 The Museum of the North is a thriving visitor attraction, a vital component of the University of Alaska Fairbanks, and the only research and teaching museum in Alaska. An expansion completed in 2006 nearly doubled the museum’s size and added a research center, learning center, and Alaska art gallery. The museum’s unique collection offers the public a view of the rich and varied cultures of the North. Homeschool Day at the museum is held annually in October. Homeschoolers can also make the museum a part of their learning all year round. Enjoy a visit, plan a lesson or engage in special events. Visit the museum’s Homeschool Page. It’s an exciting time to be a student these days, as there have never been more ways for high school students to receive a quality education (and dual credit) from the comforts of their own home. UAF eLearning offers online classes with the best course and content delivery available, including support services that prioritize student success. And with more than 250 online offerings, there’s something for everyone. Consider eLearning for dual credit to get a head-start on a college education. UAF recognizes that education is an individual process, different for each person. Individualism and diversity are Alaska traditions, and many UAF students are nontraditional. At UAF there is not only a broad mix of cultures and ages, but also a climate of respect for individual rights and preferences. In that spirit, UAF has admitted hundreds of home-educated students in the last several years, and probably thousands over the last decade. Submit a parental transcript (high school level) with classes, grades, credits, and cumulative GPA listed. This transcript does not need to be notarized.